Creates a static polar or rectangular array of entities; displays prompts at the command bar. This command creates linear, rectangular, and polar arrays. Specifies the entities to be arrayed. Use any entity selection method; press Enter when you are done. Creates linear, rectangular, or square arrays. Specifies the number of rows; for a linear array, enter 1. To draw the array downwards, enter a negative number. Specifies the number of columns. To draw the array to the left, enter a negative number. Specifies the distance between rows of entities. Specifies two points that indicate the spacing between rows and columns. Specifies the distances between columns of entities. Relocates the base point of the selected entities. Specifies the center point; enter coordinates or pick a point. Specifies the angle between each copy. Determines the extent and direction of the array. Enter 360 for a full circle of copies; enter a smaller number to draw a partial polar array. Enter a positive angle to draw the array counter clockwise; enter a negative number to draw the array clockwise. No does not rotate entities; all copies look the same as the original. 3dArray - creates 3D arrays. 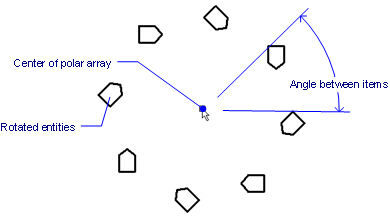 Array - associatively distributes entity copies in an evenly spaced rectangular, polar or path array. ArrayClassic - creates a static polar or rectangular array of entities through a dialog box. ArrayEdit - allows editing associative array entities and their source entities. ArrayPath - associatively distributes entity copies evenly along a path into multiple rows, and levels. 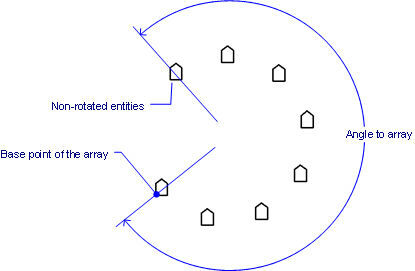 ArrayPolar - associatively distributes entity copies evenly in a circular pattern about a center point or axis of rotation, using multiple rows, and levels. ArrayRect - associatively distributes entity copies into any number of rows, columns, and levels. MInsert - inserts arrays of blocks.